Because of some poorly formed intranet pages, I was only able to view them in Safari this morning for some reason. Because I already had that browser open I started opening several tabs and going to news sites etc. I clicked on one link and the above error message appeared after a few second long delay where the browser seemed to have completely crashed. Needless to say, it scared the heck out of me! People have told me I’m paranoid, but this little episode shows there really is value in doing this. 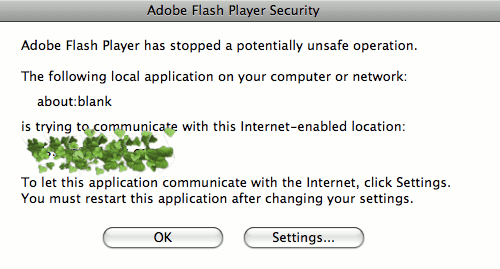 If Adobe hadn’t included this check, personal information could have been transmitted to a third party. In fact, I used a web browser even as late as last year that didn’t include any of these security and privacy features, so for how long was I loading Flash files that could transmit information without my knowledge? I’d rather not think about it. I talked about the Firefox privacy and security extensions I use in a previous post this month.